Congratulation’s to Banbury Central on winning the Tony Allcock Over 60’s Mixed Double rink Trophy. Since reaching the quarter-finals played at Worthing in it’s inaugural year 2011, the Central club have been stalwart supporters of the competition each year and for the last few years, the only club to enter the competition from Oxfordshire. Being part of the Buckinghamshire / Oxfordshire group, Central overcame teams from Iver HeathBC, Marlow BC, Stony Stratford BC and in the last 16, Stroud BC. In Saturday afternoon’s quarter-final against Huntingdonshire’s Hemingford BC they won an exciting game 33-32 and looked forward to an early start from Banbury on Sunday morning. Their Semi-final opponents were Cove BC from Hampshire who proved admirable opponents, Central recording a four shot 38-34 win. It was good to see Oxfordshire bowlers other than Central members giving their support. In the afternoon’s final they came up against 2016 winners Lindfield BC from Sussex who went off on a flyer only for the Oxfordshire rinks to not only pull back, but move into a good lead. Not to be outdone, Lindfield came back into their own, eating into their opponents lead to make the last quarter of the game look exciting. Central took up the challenge and steadily moved away to win on both rinks and take the title with a 47 – 35 victory. Rinks scores were, Mary Tee, Brenda Havard, Nigel Galletly and Michael Andrew won 20-16, Eloise Jones, Pam Shepherd, Graham Morbey and Keith McNeil won 27-19. The reward for try, try again. OBA Deputy President Mike Morris and his wife, BOL Treasurer Margaret won the Friends of English Bowling members, two-wood pairs competition, during the National Championships on Tuesday. Their success was achieved after playing five 15 end rounds of 2-wood pairs and culminating in a win against last years losing finalists, from Huntingdonshire. A busy day. The schedule for the Oxfordsire ladies at Leamington is listed below. Please note: Times and Greens as at time of print. Subject to changes on the day. Bowls England have switched Singles, 2Wood Singles and Pairs, Oxon A to B to avoid clashes in competitions. Oxon A Emma Gilkes Sunday 5th August 9.30am on Green B.
Oxon B Zoe Pratley Sunday 5th August 11.30am on Green C.
Jan Gore/Caroline Bloomfield Sunday 5th August 2pm on Green D.
Oxon A J Berry Mon 6th Aug 2pm on Green B.
Oxon B C Campion Tues 7th Aug 9.30am on Green B.
Katherine Hawes Wed 8th Aug 10.30am on Green C.
Oxon A K Galloway Thurs 9th Aug 2pm on Green B.
Oxon B C Campion Fri 10th Aug 9.30am on Green A.
Carol Gaskins Sat 11th Aug 9.30am on Green B.
Oxon A S Waring Mon 13th Aug 9.30am on Green E.
Oxon B C Campion Sun 12th Aug 2pm on Green C.
Oxon A K Hawes Tues 14th Aug 2pm on Green D.
Oxon B C Galletly Tues 14th Aug 3.30pm on Green E.
Oxon A C Campion Thurs 16th Aug 9.30am on Green D.
Oxon B K Hawes Wed 15th Aug 2pm on Green B.
Claire Soden/Jazzmin Alder Sat 18th Aug 1pm on Green E.
Margaret Morris/Janet Fountain/Erica Brown/Angela Ives Wed 22nd Aug 9.30am on Green D.
Leicestershire v Oxfordshire Sat 1st Sept 11.30am on Green D.
The winners of the Senior Fours is the team from Banbury Borough: Margaret Morris, Janet Fountain, Erica Brown and Angela Ives. They will represent Oxfordshire at Leamington in the Nationals, beginning their challenge on Wednesday 22nd August. Played at Banbury Chestnuts on a very hot afternoon Borough put on the pressure with a four on the first end and kept ahead leading by eight shots until the 18th end when they dropped a five with Central behind by 3 shots with three ends to play. But Borough rallied with a two and a four over the next two ends leaving Central conceding the match with 9 shots adrift and just one end to play. A hard fought match in very hot conditions: Banbury Borough 25, Banbury Central 16. The last round of the Johns Trophy v Berkshire has been cancelled. 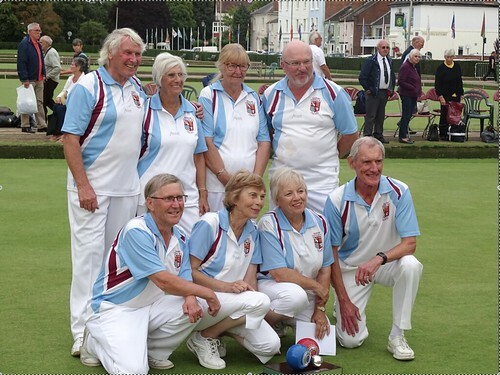 It has been mutually agreed with Berkshire and approved by Bowls England that the last round of the Johns Trophy v Berkshire on Saturday 7th July need not be played as any result would not enhance our position in the table to put any pressure on Kent at the top. Bowls Oxfordshire Ladies lost to Kent in the Johns Trophy played at Thame Bowls Club on Saturday 23rd July. Oxon only had 2 winning rinks skipped by Jeanette Berry and Carol Penson. With 2 defeats it is highly unlikely Oxon will progress but with new additions to the team, Oxon could able to build for the future. Oxon 97 4 pts, Kent 132 18 pts. Oxfordshire left at the crack of dawn to play Sussex in the southern Regional Finals at Bromley Kent on Sunday 24th June. With Mark Charlett’s rink finishing 3 ends earlier than Nick Rae-Welsh, it was up to Nick and co to save the match. Playing the 21st end the counties were level and holding shot with only the skips to bowl, The Sussex skip moved the jack back to hold 3 and nick was unable to find a way through to save the match. Sam Watts Ray Gaskins Ian Henwood Nick Rae-Welsh won 19-14. Paul Sharman Nathan Lewis A J Docherty Mark Charlett lost 13-21. Sussex went on to defeat Kent 42-25. All Square at the end. Oxfordshire played their third game of the 2018 Middleton Cup campaign with a home match against Surrey on Saturday 22rd June at Oxford City and County BC. The game swung one way and then the other with Oxfordshire again preferring the southern rinks, particularly the rink of Mark Charlett, who stormed to a 13 shot lead after 10 ends. With comfortable wins on rinks 1 and 2 for Charlett and Gaskins, the battle on rink 3 was always the closest with Baden Sparkes finally losing by a single shot. Rinks 4 and 5 went Surrey’s way and the overall result depended on the last end on rink 6. With Oxfordshire trailing by one shot and Surrey holding it was left to Nick Rae-Welsh to Trail the jack for a one shot and to tie the match at 121 shots. The final Saturday of the competition, July 7th, sees Oxfordshire travelling to Berkshire and Suttons BC for a 2pm start. Oxfordshire 121 shots 93 points, Surrey 121 shots 13 points. Sam Watts Paul Skidmore Jason King Mark Charlett won 33-14. Steve Witcombe Will Campion Shane Cooper Ray Gaskins won 22-16. Alan Carter Kevin Alder Gary May Baden Sparkes lost 21-23. Ade Kemish David Leighfield A J Docherty Ian Snowdon lost 19-26. Jim Bland Steve Aldren Nathan Lewis Paul Sharman lost 14-22. Bradley Squires Paul Comley Ian Henwood Nick Rae-Welsh lost 11-20.